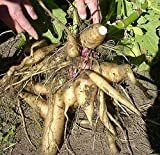 Yacon growing geophyte of the genus Smallanthus also known as Peruvian ground apple or Jicama, Yacon perennial is evergreen and in cooler places deciduous plant, can grow in tropics, mediterranean, subtropics or temperate climate and growing in hardiness zone 7+. Leaves edible arrowhead-shaped, when young it a little purplish after maturity become greenish. Flower color yellow the flowers look like look like daisies. Rhizome edible bark brown color in the inside is white, the weight of rhizome 0.2-2 Kg, taste is sweet, to make the taste sweeter should put it in the sun for two weeks after, when the rhizome is in hibernation, the rhizome sensitive to moist soil, cause to rot or the rhizome, good to store it in the in dry dark cold place. 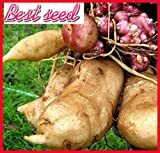 100 Seeds/Pack.Annual Fruit and Vegetable Seeds Yacon .DIY Home Garden&Bonsai Plant Seeds.